Adath’s New Legacy Wall was dedicated on January 25, 2014. The 45-foot-long wall is a stunning multimedia collage of photographs, ritual artifacts and history. It stands 12-feet tall and has 36 display boxes, eight of which are back lit panels. There is also one video screen displaying a slideshow of at least 100 photographs. “There is a lot of complexity for a project of its size,” said Sam Edelstein, the lead architect from firm MSR in Minneapolis, which designed the project with Tracy Engel-Lesneski, Principal at MSR, and a full team. 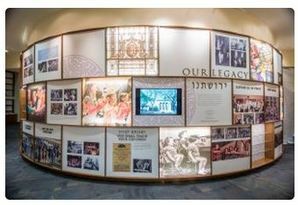 “It is intended to be a semi-permanent display to be updated as needed.” In addition to Adath and Bnai Emet, the wall also conveys the legacies of B’nai Abraham, Tifereth B’nai Jacob, and Mikro Kodesh.